Three dead civilians allegedly targeted by security forces because of Yali tribal membership. Evidence has emerged of a savage and potentially premeditated hunt of highland students by Indonesian security forces in Abepura on July 2 after the stabbing death of a police officer sparked an allegedly brutal dispersal of civilians by security forces. Three civilians and an Indonesian police officer were killed around the Youtefa market in Abepura after a failed attempt at a shakedown by corrupt police on a gambling ring degenerated into a riot. Full transparency of the events leading to the riot and behaviour by police in bringing it under control has been hard to verify, however eyewitness testimony gathered by West Papua Media (WPM) stringers have yielded new information that alleges death squads were operating simultaneously to the riot, targeting three students from a single tribal group who were uninvolved with the riot. Over twenty innocent people were also taken into custody on July 2, after hundreds of uniformed and plainclothes security forces arrested civilians and beat bystanders, Papuan shoppers and particularly civilians from the Highlands, with many sustaining injuries, after unidentified persons in the crowd of gamblers earlier attacked and fatally stabbed the Indonesian police officer, and beat up his partner. Eyewitness evidence has also confirmed that three young Yali men, Demi Kepno, Sabusek Kabak, and Yenias Wandikbo were beaten and killed well away from the riot and dispersal, by plain clothes police and Kopassus special forces soldiers. This is despite clear evidence that none of the victims were involved in either the gambling, or the subsequent riot. The violence had its immediate roots in a daily illegal game of dice (Judi Dadu) played in an Indonesian gangster (preman) run gambling den at Pasar Youtefa, by a mixed crowd of over 100 Papuan and Indonesian colonist gamblers. According to witnesses interviewed by a West Papua Media stringer, the dice gambling rings are part of an informal industry that served to provide daily living income for its organisers, but was usually tolerated by local police in return for a cut of proceedings to supplement their police salary. Indonesian military and police have a long history of running highly lucrative illegal gambling operations on everything from raffles to chicken, dog and human fighting, to premiere movie tickets. Gamblers and street thugs lured to the easy money are often recruited as the muscle behind preman organisation Pemuda Pancasila, a Kopassus proxy militia front that had thrown its weight behind the Prabowo Presidential Election campaign, casting a dark shadow of fear over Papua over recent weeks. Just after 3.30pm local time on July 2, Police Brigadiers (equivalent to Chief Sergeant) Asriadi and Samsul Huda from Abepura’s Tanah Hitam motorcycle unit, were conducting their allegedly corrupt daily shakedown rounds to demand protection money (tax) from stallholders when they arrived at the Judi venue. It is still unknown why the officers decided to shakedown this particular venue given that preman and police usually have a sophisticated and lucrative system of payoffs. Gamblers reported that the two police officers walked into the venue without paying admission, angering the Indonesian colonist doorman, whereupon the police drew weapons and demanded that all present (including Papuan and colonist spectators) pay a flat rate “tax” to the police. Witnesses claimed that the two officers and a customer began arguing after some gamblers refuse to hand over any money, saying they were tired of being shaken down. One witness claimed that the “preman” (gangster) manager of the venue pushed the police officer, complaining that protection money had already been paid to a higher ranking officer, and the shakedown would be reported. The officer Asriadi then smacked another gambler, the relatives of whom retaliated by seizing his rifle and throwing chairs, bottles and other objects at the fleeing officers. None of these claims could be independently verified by WPM. Claims that the rioters had stoned the officers to death remain unverified and only alleged by Indonesian colonist traders. No Papuan witnesses could be found to confirm the claims independently of the official police version. The commotion and cries for help from the bashed police were immediately responded to by over a hundred armed police, Brimob and members of the Australian trained counter-terror squad Detachment 88, according to witnesses who described how large groups of armed men came running from every direction within seconds of the initial chase. They in turn were joined by over 50 plain clothes intelligence, police and military, including scores of Kopassus ojek riders, in seizing and beating large groups of civilians randomly, including traders and shoppers. Reports remain unconfirmed whether security forces opened fire directly on bystanders at the markets or fired into the air, but many gunshots were heard by various witnesses, causing Papuan civilians to flee from the area. Nine Papuan gamblers were taken into custody as suspects, however the perpetrators of the fatal beating and those who had seized weapons were allowed to escape by security forces. In addition, police and plain clothes agents arrested a further 14 Papuan bystanders, who were uninvolved in the affray. All apart from the nine were released by police late that night, most having sustained injuries from their beatings. The status of the nine Papuan gamblers who were undergoing interrogation through to the weekend were unable to be ascertained at time of writing. The violence occurred as Papuans in Jayapura were on edge, as arbitrary arrests, shootings and unprovoked beatings on civilians by security forces intensified ahead of the July 9 Indonesian presidential election. Many Papuan civil society and pro-independence groups joined a boycott call challenging the legitimacy of Indonesia’s colonial regime. The boycott was met with calls from the Indonesian military commander in Papua, Maj-General Christian Zebua, to “shoot dead any person” distributing election boycott materials – a threat which had materialised throughout the Land of Papua. The deaths of the three young Papuan students, at a time when Indonesian police are almost exclusively targeting Yali student and civil resistance activists (who make up the bulk of the membership of the West Papua National Committee) in a nationwide crackdown on freedom of expression, will only reinforce perceptions of a premeditated Indonesian security force campaign to eradicate Papua of Yali people. “The TNI hate the Yali with a passion, as this is the tribe that Benny Wenda is from,” an observer told WPM during the investigation, referring to the high profile UK-based leader of the Free West Papua Campaign. Certainly members of the families of the dead agree that their dead children and brothers are being unfairly targeted. Sabusek Kabak (24) was a university student from the Yali village of Porongkoli in Yahukimo Papua. He passed through the Youtefa market at 8.00am from the Kilometre 9 post at Koya and continued on to the GKI Church students Hostel Liborang in Padang Bulan. According to interviews with his younger brother Wemen, friends and witnesses, at 3.30pm on July 2 Sabusek went again to Youtefa, planning to return to Kilo 9 with Wemen. After arriving at the Youtefa market he and his younger sibling didn’t have enough money to pay for the taxi back to Koya and went to look for a friend to borrow some money for their transport home. As they were looking for taxi money, the riot broke out at the market. Some ran and there was the sound of gunfire, but Sabusek and Wemen were confused. Sabusek and Wemen agreed to go together and seek protection at the Bank of Papua at the Youtefa market, without realising that there were “preman” plainclothed police manning a roadblock outside the bank. They were then confronted and surrounded by the preman who were armed with sharp knives, machetes, and pistols, when Sabusek pushed his young brother behind him and told him to escape. A transmigrant trader hid Wemen in their kiosk, however the preman police caught up and stabbed Sabusek with a bayonet through the heart, killing him instantly. Wemen and the trader witnessed the killing, as the preman walked away and left Sabusek’s body there. A woman from Biak, unknown to Wemen, told the migrant who had helped Wemen escape, “That is my child. Come my dear child let’s go home”. She then took Wemen to the protection of a Church hostel. Sabusek’s body was not picked up by Police until the morning of 3 July 2014 by Police, who took his body to the Bhayangkara Hospital. The Kabak family were initially prevented from retrieving Sabusek’s body, and were forced to return with the Abepura Police Chief and District Head so the family could take the body. He was buried on 4 July 2014 at the public cemetery in Tanah Hitam, Abepura at 3.00pm by his family. The Kabak family have demanded that the Papuan Police be held accountable for Sabusek Kabak’s death, and that there be an immediate arrest of those responsible and they face the process of law in the immediate future. Neither was the second victim involved in any form of opposition action against the police, yet he was savagely beaten until dead. Before the riot at the Youtefa market started, Yenias Wandikbo, a 20 year old Yali student, had been drinking alcohol together and relaxing with a friend during that day at the Engros Beach, until they ran out of drink in the early afternoon. Yenias and his friend then headed home from Engros via to the Youtefa market. In going there they reached the front of the YAMAS campus still unaware that there was a problem at the market, where they separated because of the everyday threat posed by security forces when buying alcohol. Yenias stumbled upon the riot area and straight into an ambush of plainclothes Indonesian preman – believed to be Kopassus soldiers by witnesses due to the impunity in which they moved. These preman then caught, beat and killed Yenias, witnessed by many in broad daylight less than one hundred metres away from the Youtefa market. Yenias was beaten about the head with such extreme force that his brow, nose area, and rear of his skull was split apart. After Yenias was killed, his body was taken by the police to the Bhayangkara Hospital, where it was held until 3.20pm on July 4. Yenias’ family took him home to Nayak Hostel in Abepura, in order to transport his body to be taken back to Wamena. Demi Kepno, a 24 year old Engineering Student of Yali origin from Abenah District, Yalimo, was killed after being abducted by police in Abepura, at the same instance as the gambling ring was being broken up in Youtefa market, but some distance away from the market. Demi was brought to the Yanmor Police station in Tanah Hitam just above Abepura, where he was interrogated by fully armed anti-terror police. He managed to escape from the Police station, fleeing in the direction of Tanah Hitam Mountain. The police and plainclothes agents gave chase and Demi entered a house of a Butonese migrant, which was surrounded and searched by police, cornering Demi around 5.15pm local time, according to witnesses interviewed by WPM’s stringer. Demi allegedly picked up a beam of wood in self-defence as police opened fire on him, hitting him in the abdomen. However, the gunshots did not kill him, so the plainclothes agents were seen to repeatedly stab Demi in the chest and neck with a bayonet, until he was dead. His body was taken to the Bhayangkara Hospital, and the victim’s family took the body away at 4.35pm the following day to the family home at Tanah Hitam, and was buried in Abepura at the public cemetery on 5 July 2014. Indonesian police in Abepura and Jayapura refused several attempts by WPM to provide a response to these allegations. Several hundred students and civil society members led by the Papuan Student Movement (GEMPAR or “Uproar”) holding a peaceful demonstration in Jayapura today were again blockaded by around 200 armed riot Police who imposed a ban on the gathering, after a similar gathering on March 4 drew world attention. The demonstration was called to show the extent of public opposition to the proposed new Special Autonomy “Plus” (Otsus Plus) legislation due to be imposed on Papua and West Papua provinces later in 2014. Despite having rights of freedom of expression guaranteed under Special Autonomy legislation, large numbers of Indonesian occupation force Police banned the gathering and prevented students from leaving the Cenderawasih Universtiy (UNCEN) grounds. Scores of police were also on hand at other GEMPAR rallying points, at the new UNCEN gate, the old archway entrance to UNCEN, campus dormitories, and also outside the main Post Office in Abepura. Police prevented unarmed civil society participants from joining the rally according to witnesses, and blockaded several groups of Papuan civilians across Abepura and Jayapura with scores of riot police in full armour, several ranks of heavily armed Brimob commandos from the Sabhara Perintis and Gegana anti-terror units, including several members of the Australian funded Detachment 88 counter-terror unit, backed up by over a hundred plain clothes armed intelligence agents dispersed throughout the town. The Jayapura Police Chief, Alfred Papare, had banned the rally due to a highly restrictive set of conditions and threatened to use for against the protesters, however negotiation ensured that the day remain without violence, despite intelligence agents menacing violence. West Papua Media (WPM) stringers reported and photographed several instances where media workers were being filmed and identified by intelligence officers and police. West Papua Media journalist Nare Yare (pseudonym) reports that despite these bans, students were undeterred and began a several peaceful gathering at the old arch gates of the university at 8.30 in the morning, also gathering outside the student dormitories at Perumnas 3 Housing Complex in Waena. Other participants in the days events began a traditional cultural long march around 0920 to the UNCEN office of Lukas Enembe, Indonesia’s appointed Governor in Papua province. However Police began to confront and blockade the peaceful protesters at 1040am outside Perumnas 3 to prevent the marches from joining up, and about 15 minutes of shield charges, flying wedge attacks, physical pushing and shoving occurred between students and riot police. There were no arrests reported, nor significant injuries at his time. Later, protesters regrouped and attempted to read out statements at the Governor’s office, but police again moved in to prevent the statement criticising Otsus Plus being read in front of the Governors office. Protesters then finished the rally outside Perumnas 3, a site of martyrdom for West Papua youth, after several human rights abuses took place there, including the broad daylight extrajudicial assassination of former KNPB leader Mako Tabuni in 2012 by Detachment 88 officers. At the archway entrance to UNCEN, Gempar coordinators conducted speeches and street theatre, with a creative theatre of West Papuan students, one by one, stamping into the dust and asphalt a copy of the draft Otsus Plus legislation, shouting “Tolak Otsus Gagal!” (“Reject Special Autonomy Plus!”). This was then symbolically set on fire to finalise its rejection. A Referendum to be held on whether Papuans want Special Autonomy Plus. Even during this peaceful reading of the opposition of Papua people to legislation seen as imposed by Jakarta on West Papua, Police still blockaded the road with large numbers growing to more than 300 police, 4 trucks carrying Dalmas Papua Police from Abepura and one from Jayapura, 3 Brimob police Trucks , 1 Armoured assault vehicle, a water cannon, and two commanders vehicles. Also in Old Abe Uncen , 2 trucks Dalmas Police from Jayapura Police Station were attending with several dozen police, and a 25 member Dalmas platoon/section at Expo Waena taxi terminal. Due to this intimidation and threats of further violence from security forces, organisers cancelled the rally and dispersed just before 2pm local time. Organisers have vowed to renew their attempts to hold a peaceful demonstration on March 12. 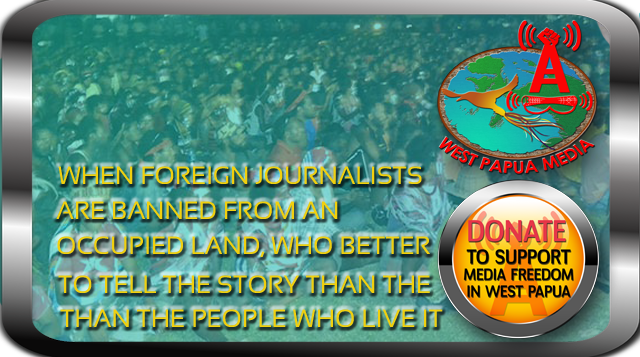 West Papua Media will be monitoring. 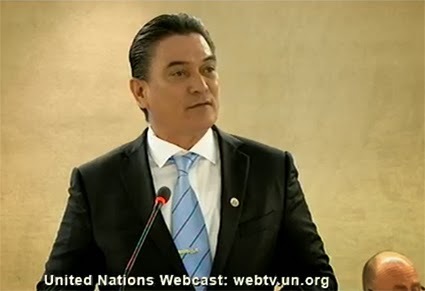 speaking at the UN Human Rights Council. The country harboured independence campaigners and refugees and frequently spoke up for West Papua in the Pacific Islands Forum. But in recent years, the Vanuatu government had become derailed from its staunch position and was courting the Indonesians for aid. Until the outspoken new Prime Minister, a part-Tahitian who is the first naturalised prime minister of Vanuatu, came on the scene a year ago. Vanuatu refused to be compromised by the window dressing Melanesian Spearhead Group “fact finding” mission to West Papua earlier this year. It boycotted the sham. Prime Minister Carcasses had already made one impassioned speech about the “debacle of decolonisation” in West Papua last November, but this one was even stronger. “Since the controversial Act of Free Choice in 1969, the Melanesian people of West Papua have been subject to ongoing human rights violations committed by the Indonesian security services,” he said. “The world has witnessed the litany of torture, murders, exploitation, rapes, military raids, arbitrary arrests and dividing of civil society trough intelligence operations. “The Indonesian National Commission on Human Rights (KOMNAS HAM) concluded that these acts constitute crimes against humanity under Indonesian Law No. 26/2000 (KOMNAS HAM 2001,2004). “In this climate of fear and repression of political dissent, and blatant negligence by the international community including the UN and the powerful developed countries since 1969, we find this forgotten race still dare to dream for equality and justice. “Injustice in West Papua is a threat to the principle of justice everywhere in the world. I do not sleep well at night when I know that in 2010 Yawan Wayeni, known as a separatist was videotaped by the security forces as he was lying in a pool of his own blood with his intestines seeping from a gaping wound in his abdomen. “It concerns me that in October 2010 Telenga Gire and Anggen Pugu Kiwo were tied by the military and were severely tortured. It concerns me when I see the video footage of a group of Papuan men bounded and being kicked in the head by uniformed soldiers who are meant to protect them. “I am worried because between October of 2011 and March 2013, 25 Papuans were murdered and nothing has been done to bring perpetrators to justice. “And it embarrasses me, as a Melanesian, to note that roughly 10 percent of the indigenous Melanesian population have been killed by the Indonesian Security forces since 1963. While I acknowledge the 15 years of reform that has taken place, I am also worried that Melanesians will soon become a minority in their own motherland of Papua. “In a world so now closely connected with innovative technology, there should be no excuses about lack of information on human rights violations that have plagued the Papuan people for more than 45 years. “Search the internet and research papers by academic institutions and international NGOs and you will find raw facts portraying the brutal abuse of the rights of the Melanesian people in Papua. A broad united front of disparate Papuan civil resistance groups has come together to hold Peaceful gatherings across West Papua, in support of Vanuatu Prime Minister Moana Carcasses’ call for international action on West Papua at the United Nations Human Rights Council in Geneva today. PM Carcasses used his ten minute address at the High Level segment of the 25th Session of the UNHRC to reiterate a call made at the UN General Assembly last September, for the UN to establish a specific Country Mandate on the situation of human rights in West Papua and to revisit honestly its role in the fraudulent Act of Free Choice of 1969. The Vanuatu PM, long a champion for his fellow Melanesian’s right to self-determination in West Papua, used an impassioned speech to highlight “grave injustices facing West Papuan people” and to demand the international community take concrete action to end the suffering. “In a world so closely connected with innovative technology, there should be no excuses about the lack of information on human rights violations that have plagued the Papuan people for over 45 years. Search the Internet and research papers by academic institutions and international NGOs, and you will find raw facts portraying the brutal abbuse of the rights of Melanesian people in Papua,” Carcasses noted. Earlier on Tuesday in West Papua, the vibrant gatherings – organised by university students and supported by a broad coalition of civil society and pro-independence groups – were predictably dispersed forcefully by Indonesian occupation forces, however organisers claimed success in expressing their aspirations peacefully and without bloodshed. Significantly for the struggle for self-determination in West Papua, the participant groups included the widest range of Papuan resistance components seen together for over ten years, with the united front coalition pulling together previously opposing groups under a common banner of supporting the Vanuatu Prime Minster’s efforts to get West Papua on the international agenda. Activists and leaders from the West Papua National Authority, National Federated Republic of West Papua, West Papua National Committee, the Papuan Women’s Movement, Papuan Traditional Council (DAP), West Papua National Coalition for Liberation, GaRDA-Papua , FRONT PEPERA , The Street Parliament (PARJAL), Papuan Student Movement (GEMPAR or “Uproar”), AMPTPI (Association of Central Highland Papuan Students), KMPB (Coalition of Papuan students Rise! ), Papuan Students Alliance (AMP), Christian Youth Solidarity Papua (SKK-P), Papuan People’s solidarity for Democracy and Human Rights (SHDRP), all agreed to support the UNHRC support action being coordinated by the Student Executive council at Cenderawasih University in Abepura. Led by University and high school members of the Movement of Papuan Students (GEMPAR or “UPROAR”), the mass gathered early on Tuesday morning in front of the the Cenderawasih University (Uncen) campuses at Waena and Abepura, erecting a large banner that read “The people of West Papua nation, support the Government of Vanuatu pursuing violations of human rights committed by the Government of Indonesia in West Papua”. Speeches were made outside the campus entrance until 1025am local time, when Indonesian police from Jayapura station attempted to forcibly disperse the protesters listening to speeches. According to witnesses, over a hundred Police in 6 trucks, 1 Panzer and 1 Police Bus were on standby, and were heavily armed. However as the group of students passed towards Waena, Police from Sentani and Jayapura amassed at the field of They Eluay’s tomb with a full unit of motorcycle commando police (Gegana), eight trucks and three armoured cars. A platoon of heavily armed Brimob police at Post 7 Sentani completed the kettling of students to keep them confined. Students then all gathered to rally silently at the UNCEN yard fence and spread a large banner, displaying photographic evidence of Indonesian Security force’s violence against Papuan People. The events were ended by Gempar peacefully in the afternoon with no arrests. Further manifestations occurred in Fak-Fak on the west coast, Merauke on the south coast, and in Manokwari, according to local reports. The Fak-Fak gathering included a deeply sacred traditional pre-Islamic indigenous thanksgiving prayer and coffee ritual for the UNHRC plea for international attention to West Papua by Vanuatu Prime Minister Moana Carcasses Kalosil. Members of the West Papua National Committee (KNPB) and Regional People’s Parliament (Parlemen Rakyat Daerah, PRD) provided a security cordon to enable traditional elders and chiefs in Mamur village, Kramomongga district to hold ceremony in support of the Vanuatu delegation’s efforts to bring the world’s attention to West Papua. According to a description from KNPB participants of the ceremony, the elders then rejected wholly the powers of darkness and evil of all the Indonesia’s power system in West Papua. “After all this ritual is done, then the placenta from the Child returned to the Land, the mother land West Papua, who gave birth to all things, and all life is God’s nation of West Papua. Then all the evil forces of the Republic of Indonesia in Papua were symbolically collected by Mr. Haji Idris Papua Patiran, and were discarded by KNPB security, at least 100 meters from where the activity was taking place in Mamur,” the witnesses described. A procession then occured with a ritual washing of all gathered with the “water of life, in order to reconcile all the people with nature and clean the whole self of any desire to be children of the mutually hostile land.” a sacred representation of the West Papuan desire for independence. The ceremony was finished by the ritual serving of coffee. 2 . The UN must immediately take responsibility for the violations of human rights that have occurred in West Papua. 4 . People of West Papua urged MSG member countries, specifically Vanuatu, to send a special team to examine and investigate cases of human rights violations that occurred in the region of West Papua. 5 . People of West Papua urge UN member States to immediately urge the Indonesian government to open up democratic space in West Papua. 6 . 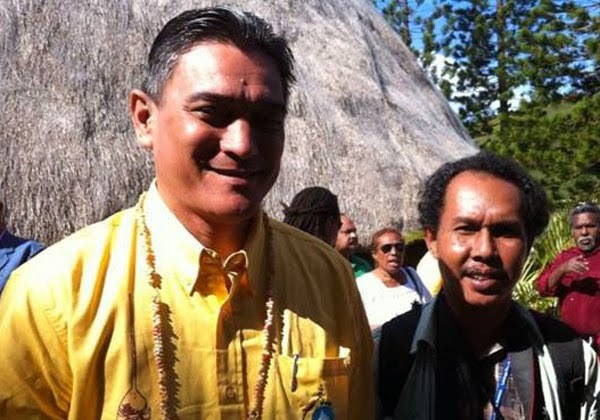 People of West Papua are asking the UN for the legal protection, over the application of the Wanted Persons List (DPO) to Buchtar Tabuni (chairman PNWP) and Wim Rocky Medlama (Spokesman KNPB), and all West Papuan independence activists. 7 . People of West Papua thank the People and the State Government of Vanuatu for the willingness to bring issues of human rights violations to the UN Human Rights Council in Geneva.